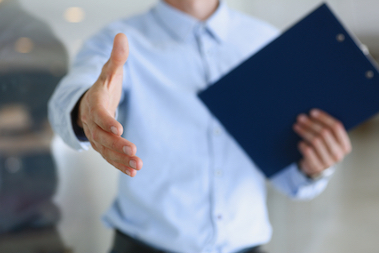 Talent retention is one of the executive pay program's most important objectives. In order to minimize situations when retention is an issue with the pay program-rather than one of its characteristics-it is important to ensure the core elements are well designed and operating effectively. A strong pay program foundation includes target pay opportunities at market-competitive levels, incentive plans understood by participants, and payouts commensurate with performance. Companies can optimize retention within the existing pay program by implementing certain approaches, such as applying differentiation in individual award opportunities and incentive payouts or improving incentive design line of sight. If special pay plans are needed for retention, additional incentive opportunities customized for retaining critical employees can be implemented. Is the Core of the Pay Program Strongly Supporting Retention? 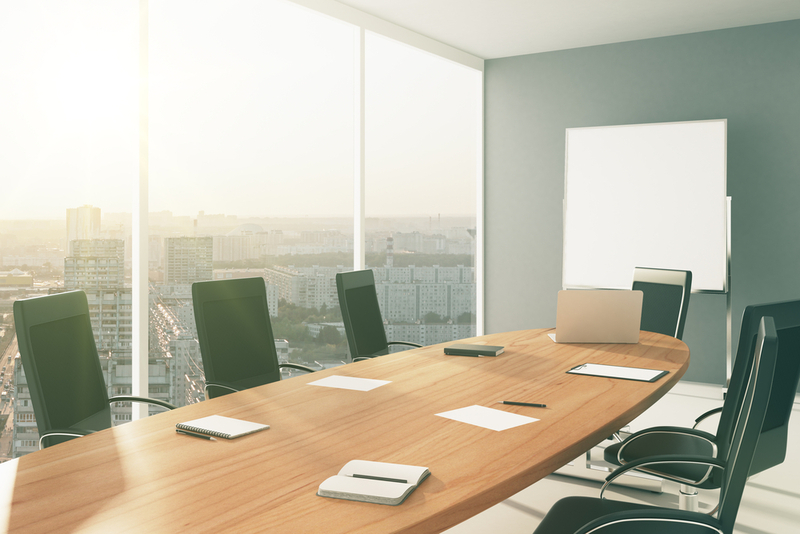 Are highly-qualified executives departing (or not joining) solely/primarily due to pay? Do employees understand the pay program, particularly their ability to impact performance / incentive payouts? 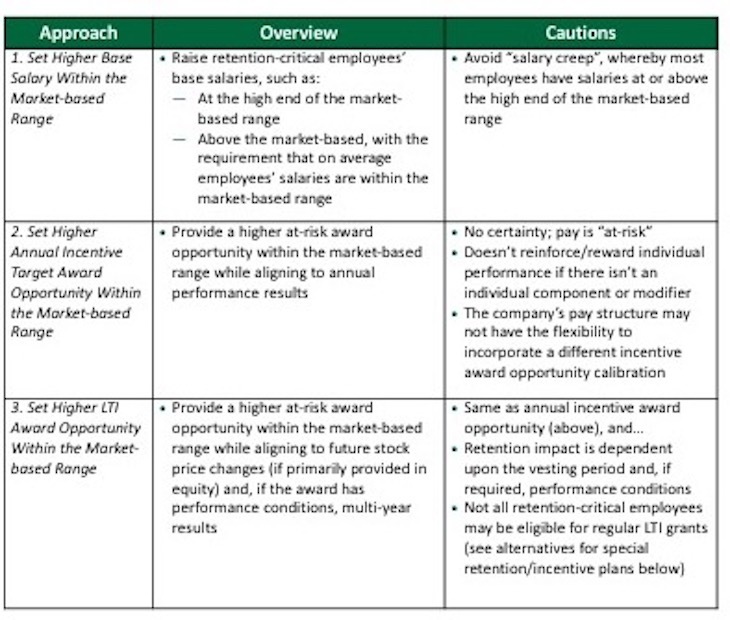 Are salary and target incentive award opportunities at the desired market positioning level? Are incentive goals and award opportunities appropriately set, with strong P4P alignment? Do participants have a clear line of sight as it relates to incentive plan goals and how they can influence performance? Does the pay program allow sufficient flexibility to differentiate award opportunities and pay outcomes? Do executives understand the value (and potential range of outcomes) of outstanding awards? If focused solely on maximizing retention, there are approaches that can be implemented within regular or special plans. 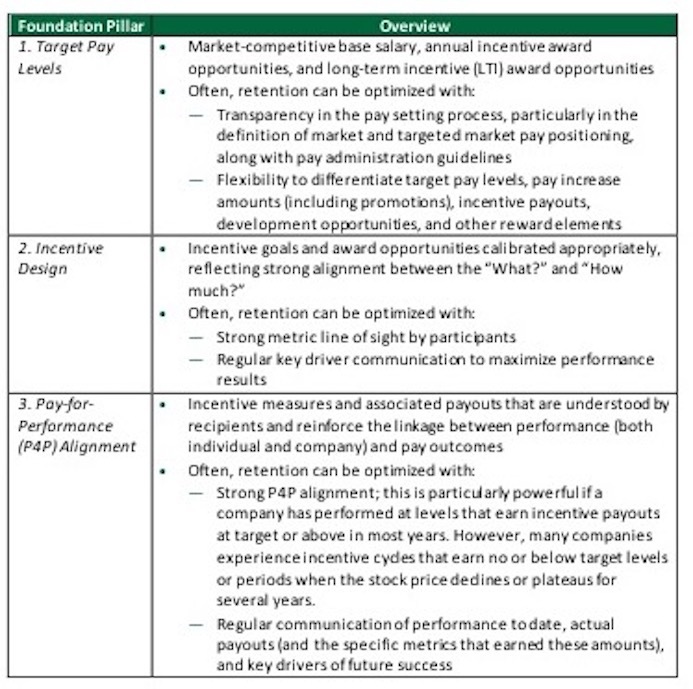 As described above, the regular pay program provides opportunities to strongly facilitate the retention (and attraction) of employees-particularly those that are deemed as "key", "hot skill", or consistently "high-performing" (collectively referenced hereafter as "retention critical employees")- through higher target pay opportunities and customized incentive plan designs. 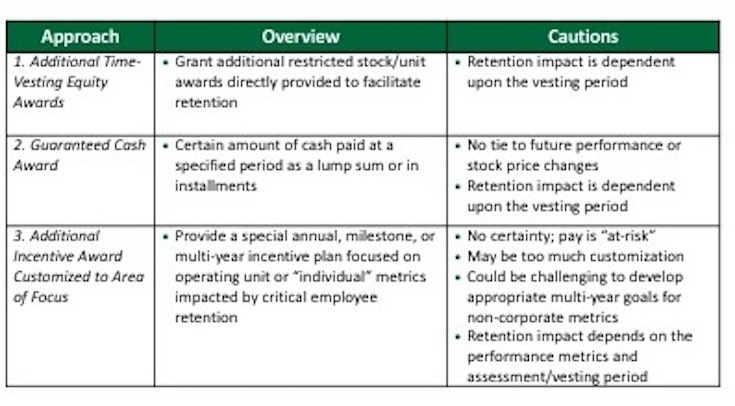 If these approaches are insufficient, companies may consider special retention or additional incentive plan opportunities, which are covered in the last section of this document. Their success depends on many factors; in applying these approaches, one should document their rationale and application (e.g., position versus individual, applicable time period, etc) in order to mitigate requests from other employees/operating units. Companies' pay administration guidelines can allow for the flexibility to deviate from the "target" market position within a stated range (e.g., on average within ±10% from the median). If used selectively, this flexibility can be applied within the existing market-based pay philosophy while strategically investing additional dollars for targeted higher pay opportunities and retaining critical employees. However, a key caution: if higher target pay opportunities are applied to the majority of employees, the pay philosophy may need to be rewritten. 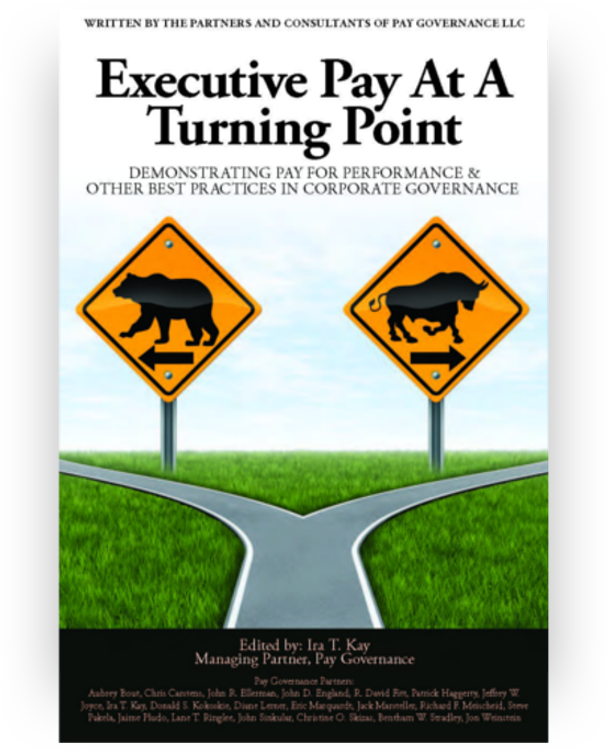 For senior executives-particularly proxy-reported officers-the most viable approach may be higher target award opportunities within the market-based range since payouts are due to performance results and the market-based pay philosophy is maintained (i.e., target pay is above the market-based range for a few positions but on average within the market-based range). In our analysis of 50 S&P 500 industrial companies, 90% that disclosed their pay philosophy targeted total direct compensations at the market median but typically administered pay within a range. Companies can increase retention-critical employees' perceived value of the award opportunity while at the same time optimizing the company's reward investment by incorporating greater line of sight in existing incentive plans. If used selectively, these approaches can be applied within the existing market-based pay philosophy without increasing target award opportunities. In our analysis of 50 S&P 500 industrial companies, nearly 50% included non-financial metrics for a portion of the annual incentive award opportunity (this may be in the form of "individual", "strategic", or other categories). 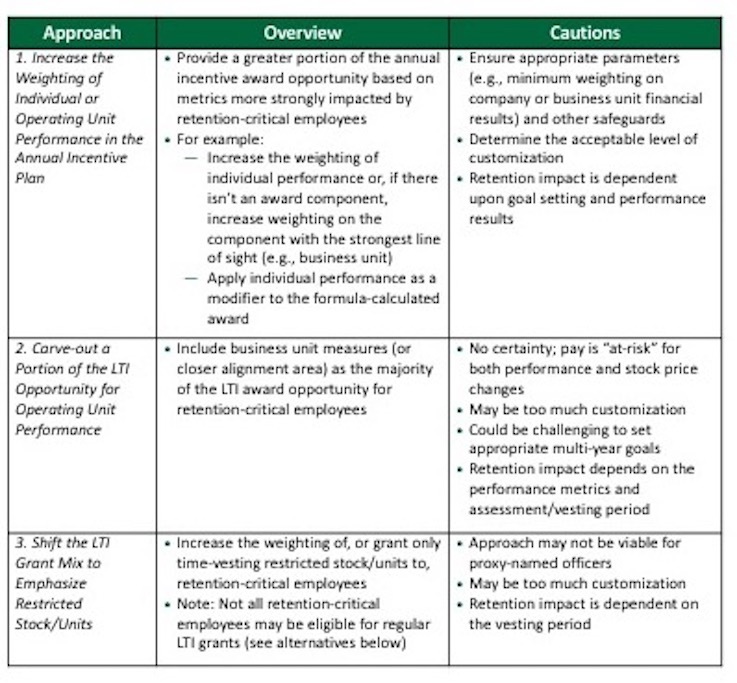 For LTIs, the use of business unit metrics for executives is uncommon (<10% prevalence). While many companies do not disclose this, the award opportunity is often provided primarily in time-vesting restricted stock/units at lower levels of regular LTI participation. If it is determined that the regular pay program is insufficient for retention, other special retention approaches can be implemented. In contrast to the approaches previously discussed, these actions would involve creating a new plan or providing additional award opportunities (over and above the regular target pay opportunities). In applying these approaches, consistent guidelines must be used to determine recipients and grant levels. Companies must attract, retain, and motivate highly qualified employees to execute their business strategy to increase shareholder value. The pay program serves an important role in achieving these objectives. 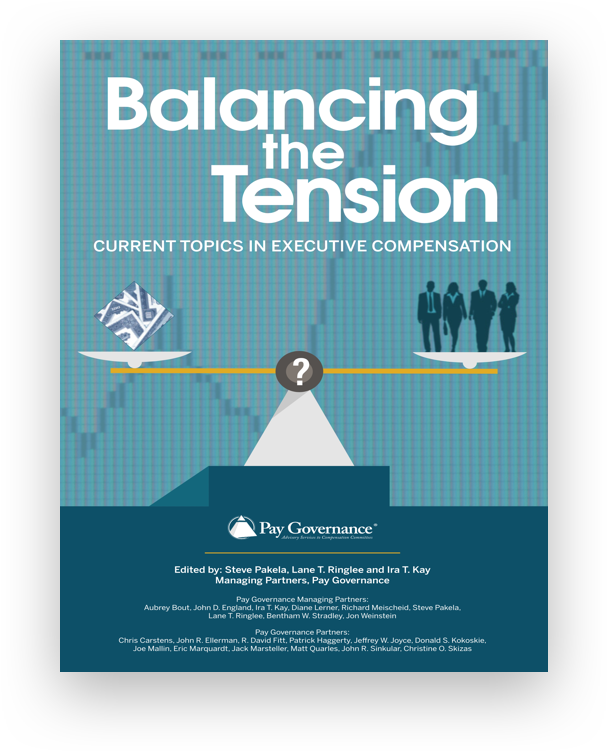 In order to maximize the retention of critical employees, it's important to ensure the core pay program is operating optimally while also maintaining a market-competitive pay philosophy. 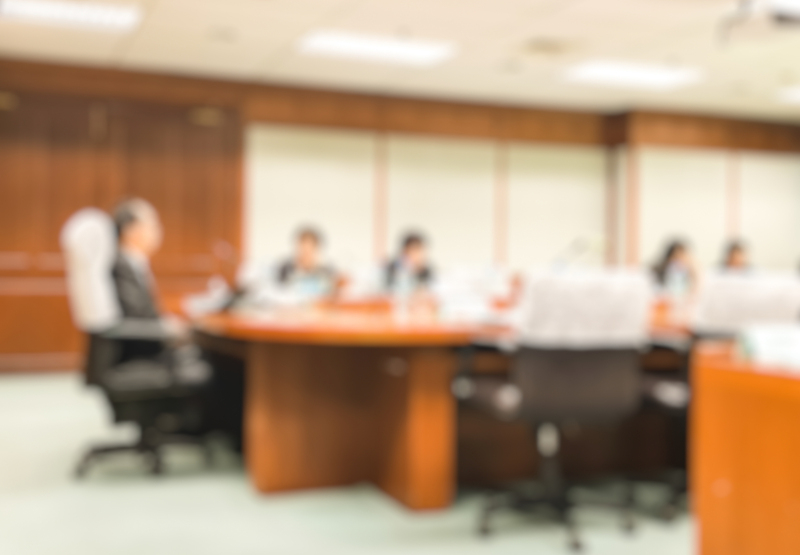 Although many companies may still find it necessary to implement special retention plans, companies should first examine whether retention issues can be addressed through the core pay program.